Berlin-based indie natural brand April Aromatics has launched Tempted Muse, a new fragrance. This natural perfume is inspired by the "Nectars of the Gods". Sweet, fruity, golden, with extracts of Frangipani, Tuberose, Jasmine, Rose, Tonka and more. My intention was to create a festive, enveloping perfume, that is mysteriously uplifting and also an aphrodisiac, inviting the wearer to intimacy. To feel their on intimacy, being comfortable in their own skin. The sweetness of this Nectar, shall remind us of the sweetness of life, that is always so abundantly available. We just need to call it in. A perfume with an Aura. Additional notes include sandalwood, ylang ylang, pink grapefruit, vanilla, anise and fruit accord. 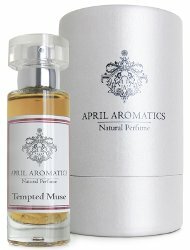 April Aromatics Tempted Muse can be found now at Luckyscent, $225 for 30 ml Eau de Parfum.